If you have been watching my insta stories for long enough, you know that Raaya loves food. I know I have been incredibly lucky to have a toddler who enjoys her meals and isn’t fussy at all. I have been quite often asked that what do I feed her or that how I did it. Honestly, I don’t think I can take credit of that. I know all kids are different, and it was just sheer luck that my kid so far is really easy when it comes down to food. We do have our days once in a while when she refuses to eat anything but I think that’s genuine as sometimes we adults don’t feel like eating either. However I do have some things to share that I think might help a fellow mama out – tried and tested. Play with food – Since the beginning when she was 6 months old – I have let her play with food. I have never worried about the mess afterwards (which sometimes took a good half an hour to clean up). This way she didn’t ever feel forced to eat and hasn’t ever been afraid of tasting something new. I started placing food in her plate in high chair and the three of us used to sit together on dining table and eat. I used to help her pick bites but she has always fed herself. We still do the same. This does mean that we all eat our dinner by 7 pm, which actually works well for us too. Everything’s done and clear by 8 pm and we get a good quality family time before going off to bed. 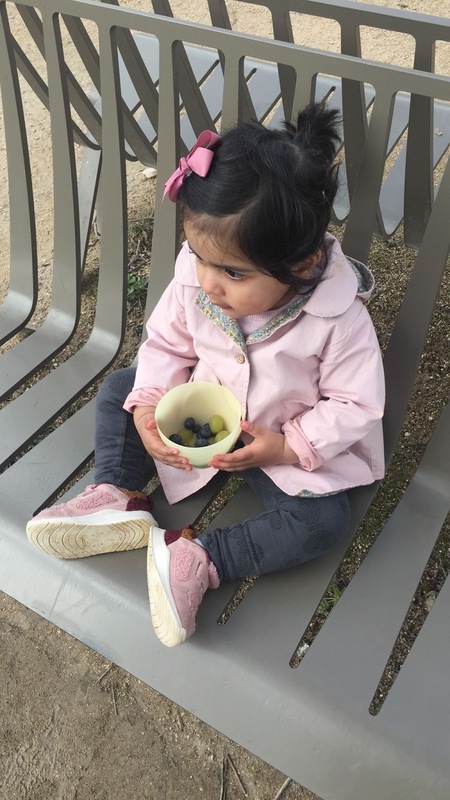 Lots of fruits – Most of Raaya’s snack includes fruits – strawberries, blueberries, plum, banana, avocado, apples, you name it she loves it. Even when we are out and about – I always have plenty of fruit for her. I do bring a fruit pouch for emergencies but we seldom use it. Don’t force it – I never force Raaya to eat something. I serve her meal on her little table and chair, she eats what she wants to and then gets up and leaves. It’s hilarious to watch. I take it that she is full and that’s why left. If she leaves without even touching her food, I let the food on table for another 15-20 minutes, and let her know once or twice in between that the food’s waiting for her. If she’s still not interested, I take the food back. Last thing I want is to be running around her with a plate in my hand. Motherhood is already hard enough. Snacks on the go – So we don’t buy snacks for her when we are out which is quite a lot. Even if we are eating outside, I pack her lunch with me. Our snack bag includes roasted peanuts, boiled eggs, bowl of fruits (grapes, blueberries, and strawberries or anything that’s in season) apples, rice cakes, popcorn, and biscuits. Variety – We try and eat variety of meals each day. For example in breakfast I shuffle between boiled eggs and mashed avocado (with lemon and salt), omelette and baked beans, paranthas, pancakes with cherry sauce, waffles, cereals, etc. As I bring the plate to her little table and chair I make exciting noises to draw her attention to what’s in menu today. As funny as it sounds, it actually works a treat. She goes ‘Wow Wow’ as she runs to her table and seats herself. Feeding the toddlers is certainly the most challenging thing. Love your ideas of making it the most exciting time for the kiddo. Nice to know these little things !